Our Journey from Livingstone to Lusaka is relatively brief and scheduled to take six hours. The Muhwanza Family Bus service leaves surprisingly on time and soon we are hurtling down the road overtaking trucks on blind bends. It’s only six weeks ago that Zambia experienced a terrible bus crash where over 50 people were killed and I wonder if our driver missed the news of this event. 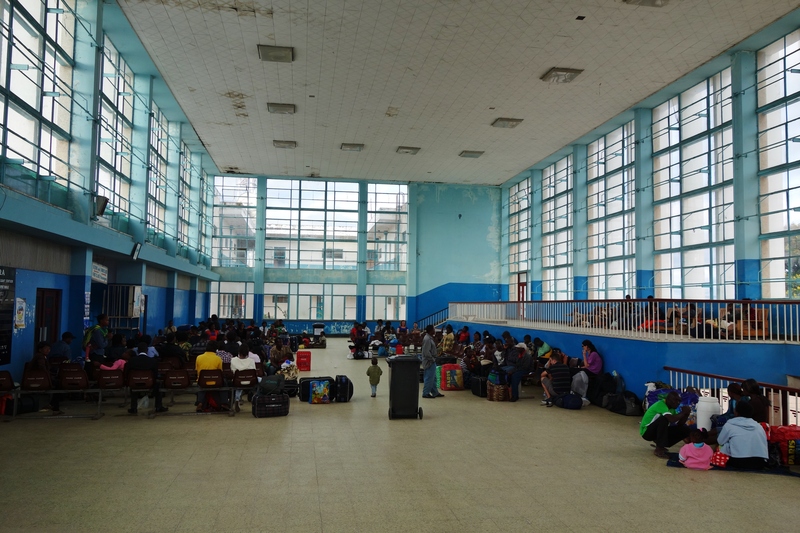 The inter-city bus terminal in Lusaka is soggy but this has not stopped the local unlicensed taxi drivers from gathering around as each bus arrives. This is madness. I feel like a discarded chip at the beach being fought over by angry gulls. We look for the licensed drivers but there are none. They are all parked outside the intercontinental hotel some 5km away! We remain calm and endure the barrage of questions, collecting our thoughts and letting the gulls know we are in no hurry, especially when they are asking triple the going rate for a short journey. Eventually as they disperse we get a reasonable offer and head to an area 3km north where there is a small collection of cheap hostels. The first is full and does not allow camping. The second camp site is a construction and is currently under two inches of water. For this privilege they want $10 USD. Eventually after a bit of a walk around I find the Broads Hostel, no camping but the small chalet with shared bathroom is only $20USD and seems the best on offer. I wonder what the catch is and wait to find out. It’s Sunday afternoon and nothing is open so we go through our packs looking for new and improved ways to make everything fit. The Broads Hostel also doubles as a popular BBQ restaurant and soon pulls in a large crowd of entertaining locals who gather to slap backs and solve Africa’s problems over a beer. They stay onto 2am. Catch is now clear. The next morning we rise early as there is much to do and we want to get out of Lusaka as fast as we can. We need to arrange visas for Tanzania, so we head to the consulate first so we can submit our passports and pick them up in the afternoon. 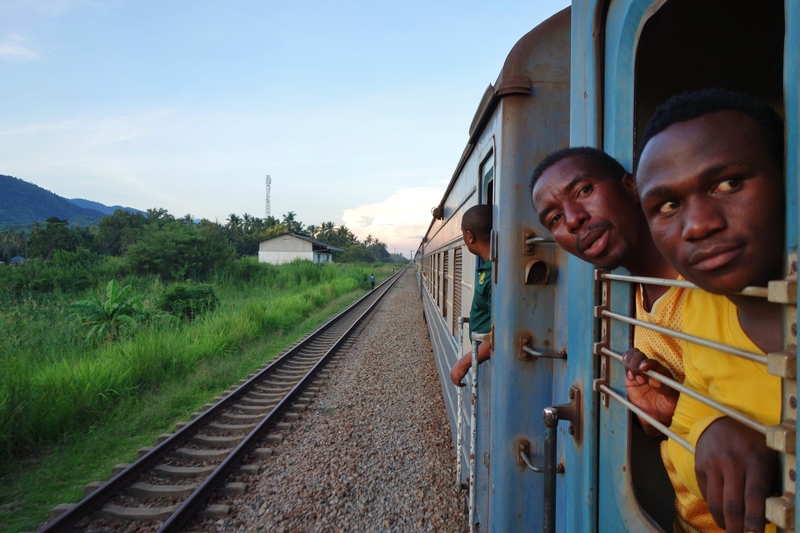 While the visas are being processed, we set about trying to get information on how to book the Tazara train which leaves tomorrow afternoon, or the mythical MV Liemba which sails from Mpulungu on Friday. Several travel agencies are unable to help us with either option. 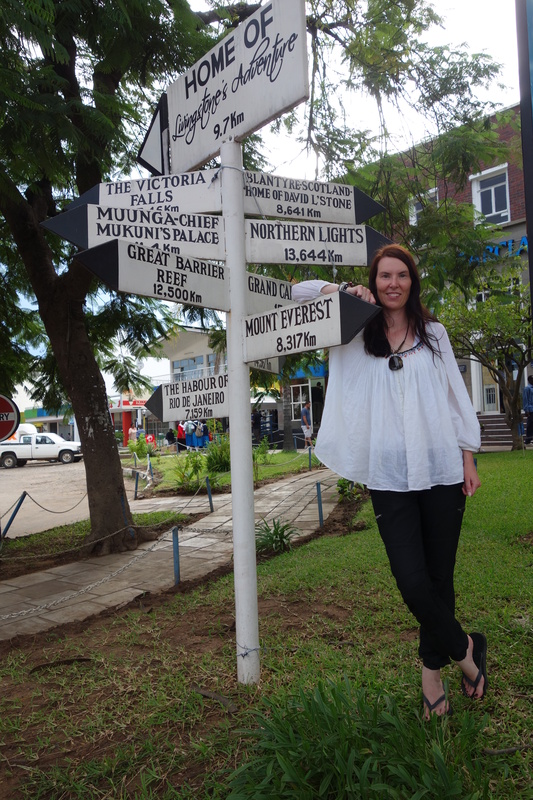 Voyages travel who market themselves as Lusaka’s finest proves about as useful as a mammary gland on a bull. It seems flights are easy enough but ageing charismatic battleships on Lake Tanganyika are out of the question. Frustrated we hike across town (refusing to take a taxi) to the Tazara office and try to get berths for tomorrows train to Dar es Salaam. It’s a no… the allocation in Lusaka is sold out and we are told we might be able to get seats in Kapiri Mposhi itself. We are now faced with a choice, both of which carry no certainty. We either travel 13 hours by bus, once a week to Mpulungu arriving at 1am and see if we can get a cabin on the Liemba by asking around. If we can, we still have no way of knowing if the connecting train from Kigoma that runs twice a week and is 40 hours to Dar has any compartments? We could always just sleep on the deck for three nights with 800 Zambians and Tanzanians, but I am not sure Emma would agree. Actually she probably would maybe it’s me. The second option is to travel 3 hours to Kapiri Mposhi tomorrow morning and see if we can get a compartment on the train (50 hour service) to Dar es Salaam by way of Mbeya at the station. We decide as its closer and leaving first, we will try our luck there. If this fails we will be able to get the bus on Wednesday to Mpulungu and get the ferry no matter what class they have. 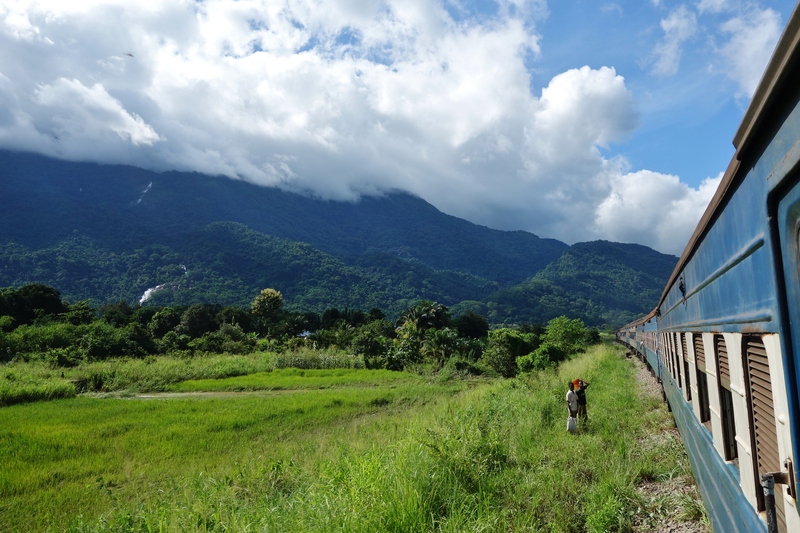 Kapiri Mposhi is a small little town with no charm or reason to exist other than the Tazara railway connecting Zambia with Tanzania. It’s as though they ran out of money and could not continue the service all the way to Lusaka. In fact that is probably what did happen. Mr Mosi wears a clean navy jacket and is the station officer. We squeeze into his tiny office and enquire about available compartments. There is no 1st class but 2nd class berths are available. We are not allowed to travel together unless we buy all six places. The price is steep about $250 USD in total. The train is scheduled to take 50 hours and suspecting it will be longer, the decision is made to take the entire compartment. We feel a bit sad as the Liemba promised much but its myth will remain just that for now. Emma glancing around “New Kapiri Mposhi” station struggles to spot anything new. The toilets are kept immaculately filthy but we use them anyway. The smell of urine and God knows what else is so strong it stings your throat and makes your eyes water. 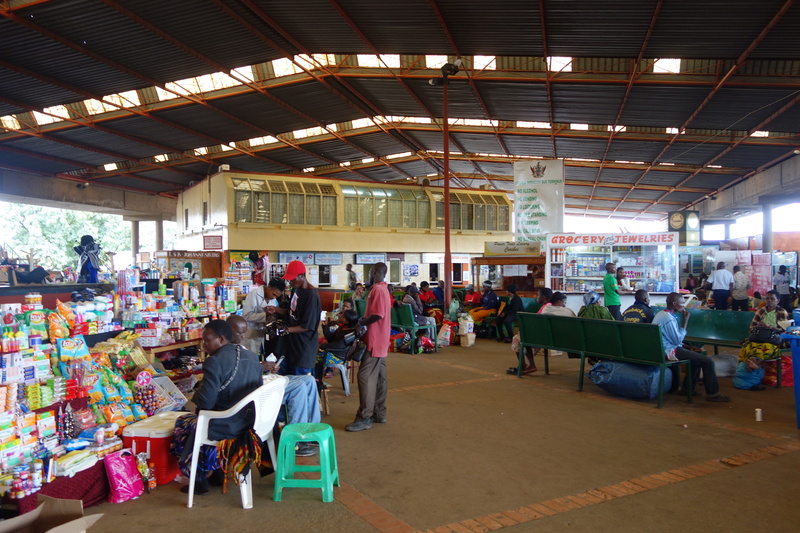 The station swells with passengers throughout the day and even a few other Muzungu’s arrive. It’s fun to watch their faces as they exit the ablution block. The train is due to depart at 4pm but this is surely too much to expect. We prepare ourselves for tomorrow morning just to be sure. Word spreads through the station that a derailment will delay our start for several hours. I confirm this with Mr Mosi who looks worried but assures me it will only be a couple of hours. I apply the rule of double and this proves accurate, The Mukuba Express creaks and groans away from Kapiri just after 8pm. Joining us on the journey is Flynn and Imogen from the UK and three Canadians who are in 1st class. Already there are guesses as to when we will arrive and I allow 24 hours extra and take a stab at Friday lunch time. Our compartment is drab and bares the scares of neglect. The door will not lock which dictates that one of us must always be in the compartment at all times. The scenery for the first 24 hours is fairly unremarkable. It’s an endless sea of low green scrub. It may be unfair but it feels aside from Victoria Falls that most of Zambia has been this way. We arrive at the border with Tanzania around 6pm after 22 hours since leaving Kapiri. The formalities are simple enough and we are spared the usual silly questions that all customs officers are taught around the world. On the heels of customs come the money changers. I have about 80 kwacha left and manage to get a rate of 285 shillings about 15 short of what it should be. I have no other option as there will be no banks in Dar that will change it later and the dining car will oddly no longer except them once we have crossed into Tanzania. We arrive at Mbeya around 10pm after a fine meal of rice, chicken and chutney. The train sits along a gloomy platform lit but just a couple of fluorescent tubes. Martin, who is in charge of the train, assures me we will only be here for a few hours! I smile and ponder his use of the word only. Morning comes and we are stranded at a new station only 120km up the rails from Mbeya. The Zambians who have been waking us up each morning at 5.30 are at it again but they are now packing and the rumour is the train will be stuck here for a day. They have business in Dar and have decided to abandon the train in search of a bus. Most of the train empties but we are determined to see it through and surprisingly the train pulls away about an hour later. Martin confirms there is another derailment about 300km ahead and they are fixing the tracks. We will proceed slowly hoping the tracks are repaired by the time we arrive. The scenery has gone from boring to spectacular. We carve a path through rolling hills, dense jungle and dark tunnels. The train picks up speed as we descend a pass and the temperature and humidity rise alarmingly. We pull into Mlimba around 4pm on Thursday. We are already 4 hours behind the scheduled arrival time into Dar with a long way to go. The tracks are not ready and we are stuck here in the middle of nowhere hot and sticky with not even a breeze for relief. Martin delivers bad news; it’s going to be at least 12 hours. The rule of double bares no thought. Where there is a station there is a town and we all go in search of some cold drinks. 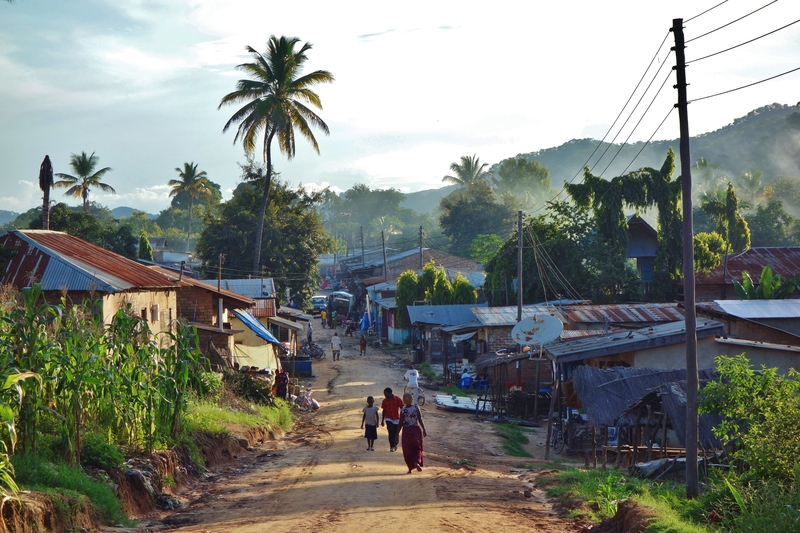 The town of Mlimba is not on any tourist map; in fact I am not sure it’s on any map. It proves to be an oasis though. It’s rough and shabby but somehow beautiful. A stroll through the main street is causing a small commotion as people come to their doors and children call out Muzungu (white person). I feel lucky to be here and on the train. This is real Africa. The delays, the charming people, the rough little town, it’s all an adventure that I would not swap with the passengers of the five star train; Pride of Africa that now sits next to us. I envy the bathrooms but not the experience. Webster who is built like the middle weight champion of Zambia calls us over to a plastic table set up in a small garden. 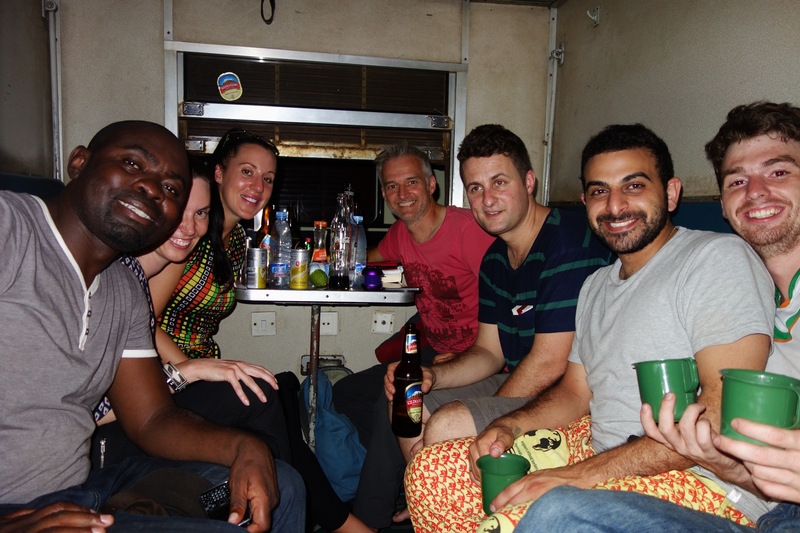 He is also on the train travelling to Dar with business colleagues, so Flynn, myself, Imogen, and the Canadians all join them for a beer or two. I don’t stay too long as Emma is guarding our compartment. Walking around the pride of Africa, I can see the AC’s condensation running down the windows. The men are wearing bow ties for dinner. Now I am jealous but still, the drinks and conversation with Webster and his friends in the garden are more rewarding. Night consumes Mlimba and both trains sit together in stark contrast. “The pride” is lit up like a Christmas tree; ours hides its ugliness in total darkness. Emma sits on the platform reading her kindle. We are both enjoying the experience for this is what overland travel is all about. Meeting the unexpected and making friends with people you are unlikely to ever see again. Friday morning and still we are parked at Mlimba station. Webster informs us that the Doctor on the Pride has been assured that we will be leaving in about three hours. We take this as reliable information as most of the passengers are on holiday and have flights to catch or reservations confirmed in Zanzibar. The toilets on the train have been locked and Emma is forced to locate a suitable place in the jungle. The spirit of adventure is waning this morning as perspiration and dehydration take over. The skin starts to crawl and your clothes begin to stiffen. We have been in our compartment so long that even the cockroaches have become familiar and are no longer hiding in the cracks. Even the locals are feeling the pressure and demands are made to Martin this is not acceptable. Tazara railway compensates everyone with 3000 Tanzanian shillings about $2 USD. I realise we have purchased 6 tickets and make sure I receive compensation for 6 passengers. The Doctor on the Pride is right and we leave Mlimba around noon. The familiar platform pulls away. I wonder if we shall ever see it again. Wind blowing through the carriage is a welcome relief. The scenery is wonderful. More high mountains draped in green jungle. Small Children run and wave as the train passes each village. We make good progress and Martin informs us we will arrive in Dar about 2am tomorrow morning. The fourth night settles over the Tazara and the best is saved for last. We sit in our compartment with the lights off. The jungle must be singing loudly as we can hear it over the sound of the train which is considerable. Hundreds of fire flies blink in the darkness and a crescent moon hangs low in the sky. Everything has gone wrong but everything is just as it should be. Arriving into Dar at 2am is not ideal. We have heard recently about tourists being kidnapped in taxis from Dar station late at night and being forced with violence to withdraw money from ATM’s. It’s probably unlikely but we are in the grips of paranoia and the darkness and shadows of Dar station is not helping much. The travellers all group together for safety. The security of 7 is promising but Martin advises us to sleep in the 1st class lounge until morning. I take a walk around the station to break the boredom but a man who can’t speak and works for Tazara urges me back into the building. He places his own hands around his neck simulating choking and points outside. The message is clear and understood and I go back inside and wait with the others. Maybe I wasn’t being paranoid after all. The first ferry to Zanzibar leaves at 7am, so we leave the station at 5.45 as we all need to get some money out before we buy our tickets. The usual dodgy tout spots us and starts to hustle us for an inflated ride. We get him down to 20,000 shillings still about double. The rank outside is dark and they put our bags into plain cars. I can see there are licensed taxis waiting and insist we go with them. The tout speaks with them and some deal is made. We all ensure the two taxis will follow each other the whole way and are relieved when our driver waits for the three Canadians. We all a little nervously withdraw money, all the time peering over our shoulders into the darkness. Safely back in the taxis we arrive at the ferry terminal. The sun is up we can relax. At last Zanzibar is in reach. It feels a long way back to Livingstone when we started our journey but it has been the most adventurous part of the trip so far. We feel we are now well prepared for what Africa will throw at us next but before we do its time to soak up some sun and relax on Zanzibar’s world famous beaches. Our Bus speeds through the Namibian night smashing into insects, bound for the Zambian border still some 8 hours away. The driver seems to have figured out that there is a happy medium between freezing and sweating to death, but I have my fleece with me just in case! Unlike the trip up from Cape Town, I get little sleep and mostly listen to songs on my iPod. The bus breaks suddenly as animals, mostly livestock, stray onto the road. One donkey refuses to move and stares right into the busses headlights bringing us to a complete stop. Even when the driver sounds the horn and very gently nudges this 4 legged road block, it refuses to move. It is either stunned by the lights or simply the most stubborn animal, I can’t decide which? The conductor gets off and has to pull it from the road before we can continue. We arrive bleary eyed at the Zambian border around 8am and go through the formalities of entering a new country. Despite my tiredness I find it all very exciting. The sign across no man’s land welcoming us to Zambia is faded and slightly tilted. There is an immediate difference felt between the two countries. The Namibian customs building is rough and rundown; the Zambian building is much worse. The officer stamping us in seems a little too suspicious as to why we are coming here. I wonder what it is she thinks we might be doing aside from travelling. After a few more silly questions we are stamped in and get back on the bus. From here it’s about 3 more ‘pot holed dodging hours’ to Livingstone, a small city or perhaps town about 10km from Victoria Falls. Clive is sitting across from us and has been chatting to me during our journey. He runs and owns a brewery in Livingstone and offers us a lift to our hotel. This spares us from the hungry hordes as we get off the bus. As soon as they see you in the doorway they are shouting and almost marking you as their passenger before the light of day even hits your face. Clive seems to command some authority here as we are left alone thus avoiding the chaos of the local taxi drivers. We take our bags to his car and squeeze them in the back. The Jollyboys backpackers, (not sure how this name came to being) is only very close and we thank Clive for his kind gesture. I am always amazed how when you travel people from all over the world will help you out in little ways every day. The hostel is a pleasant little place with tidy common areas, a small camp site and some little Chalets with thatch roofs. We decide to take a chalet for $30.00 USD as we are both very tired from having a bad night’s sleep on the bus. My head hits the pillow and I think I manage to beat Emma to sleep, a rare feat. Livingstone is fortunately cool and not as humid as I had expected, we get a good couple of hours sleep and then go out to explore the town. Our first priority whenever entering a new country is to test out the ATM’s. The first one is not co-operating. I begin to wonder if we might have an issue. The second one also tells us to “go away” now I am a little concerned. Then we spot a Barclays Bank ATM, success relief, we can now buy some much needed food. Livingstone has two pretty big super-markets so we stock up on some cheap supplies. Bread rolls, some cheese and tomatoes and a large carton of fruit yoghurt which we later mix with some bananas. As we exit the Spar Super Market we are set upon by the local taxi drivers. 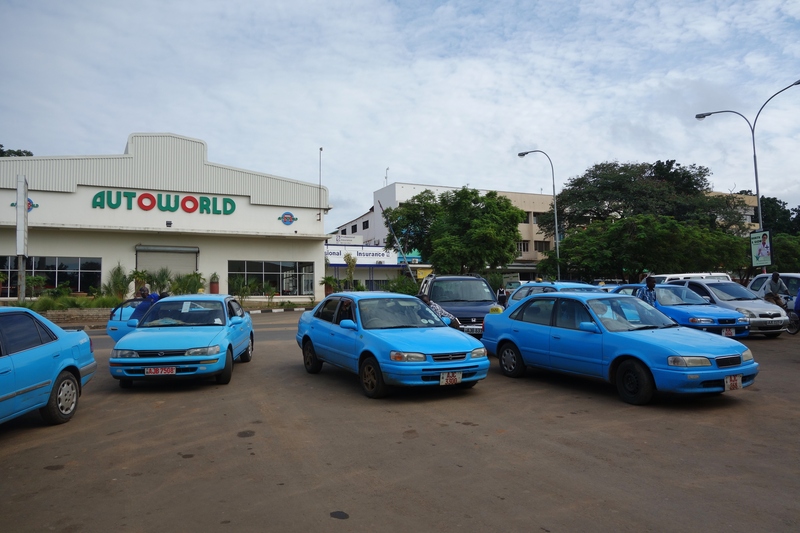 It seems like every second car in Livingstone is a bright blue taxi. Here they swarm in concentrated numbers like great blue insects buzzing and annoying every customer who exits. This is not restricted to tourists but we seem to get an extra persistent buzzing. We run the gauntlet, politely explaining we are just walking with a fair dose of No Thank You’s sprinkled on top! This seems to have abated the blue swarm but only temporarily. They will reform and no doubt return in greater numbers soon enough. The next morning we decide to move from Jollyboys to the equally oddly named Fawlty Towers. The camp site is much larger and half the price at $5.00 USD per person. We pack up our bags, which are proving to be quiet a chore and get ready to move. I can feel the anticipation of the blue swarm outside. Stuck with two 20kg bags they will have me on the back foot. Sure enough they snap to attention as I walk outside the gate. They spot my predicament and close in for the kill. Quotes for a 1km journey range from 30 to 20 Kwacha about $6-4 USD. This is still double what the fare should be and I dig in my heels and tell them 10 kwacha. Glancing at my large bags they smile and say no 20 Kwacha is best price. Okay then… I will walk. I pick up the first bag and start to carry it down to Fawlty Towers, returning to collect the second, they stare in disbelief. I have now entered the world of travel stinginess, about 30 mins of lugging bags just to save $2 USD. Stubbornly I feel proud of my work and besides I needed a bit of exercise. Later that day as we leave the Spar with groceries, some poor ignorant member of the swarm asks if I want a taxi. As I walk past, I hear his more learned colleague say “He Walks”. I smile, excellent! I now have a reputation among the swarm never to be annoyed again. I spy a barber shop in the middle of a field and safely assume he must be cheap. I approach and the owner seems surprised I am coming to see him. I badly need a cut and negotiate a price of 15 kwacha about $3.00 USD. I sit down on a plastic chair, a small broken mirror stands in front of me along with a pair of clippers and a medium sized paint brush, where are his scissors? He starts to use the clippers and brushes away the discarded hair with the paint brush. No scissors are ever used. My barber starts to sweat profusely, his face a picture of concentration. I know it is my straight hair that is causing him difficulties and he is labouring under the pressure of not making a mistake. Mzungu hair is hard to cut he tells me. Mzungu being a nick name for someone who is white. We are going to get used to hearing this lot, remember this now. If you want to get classic photos of Victoria Falls, or swim in the small pools resting on the lip, then don’t visit in March. If you want to experience power, spray and a roar that will soak you in three seconds flat and take your breath away, then this is the time to come. 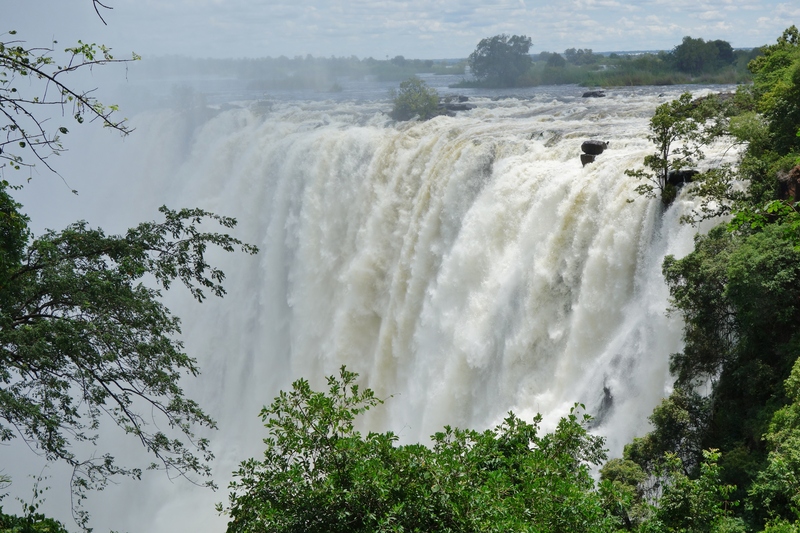 The Zambezi pours angry and brown unrelenting over the falls. It feels like all the fresh water in Africa is being tipped into this gorge at once. The wind shifts direction and we are able to see the full force of the flow behind the curtain of mist. Superlatives are in order but they all seem so cliché. Incredible, magnificent the list goes on. We step out onto a small narrow bridge and onto the knife edge. A section of land that pulls closer to the falls, allowing tiny spectators a glimpse into the mouth of the beast. Everyone is amazed and in fits of laughter as people disappear, only to remerge from this aquatic display, completely soaked. I am prepared for the wind and spray as I step onto the bridge, but it is the water falling back down to earth that is a torrential surprise. Victoria Falls is so powerful it creates its own weather system. Photography from this point would be camera suicide, unless you had a proper underwater housing. The Sun dries us quickly and we walk down a steep trail to a feature ominously called the boiling pot. The sign warns of the baboons who sit below waiting for unsuspecting tourists. The rules are simple no food or plastic bags and keep a tight grip of your backpack. The path leading down drops into a stunning little jungle wedged between steep cliffs. Hundreds of little rivulets of water cascade down the rock walls, this is an unexpected surprise and my camera is soon out. Emma walks ahead a little and comes across a small troop of fairly big baboons; one in particular looks to be in charge and occupies a bench near the path, clearly his throne. Emma is unsure and a bit scared to move forward. Just walk past them, don’t flinch just walk past you will be fine, because I have such vast experience of monkey behaviour? I don’t like this she says. It will be fine I say. I take a few more photos and then hear a scream. Oh crap this could be a problem. Then I hear and I quote “ I have a stick you f88kers and I know how to use it….sh1t Greg get down here, this one is baring it’s teeth”. I run down but Emma has already made it past. The king remains seated on his throne and gives me a flash of his dental work as well. He curls his upper lip back exposing 2 long canines each about 2 inches long, okay just keep walking, hand is tightening around the rock I have, just in case. 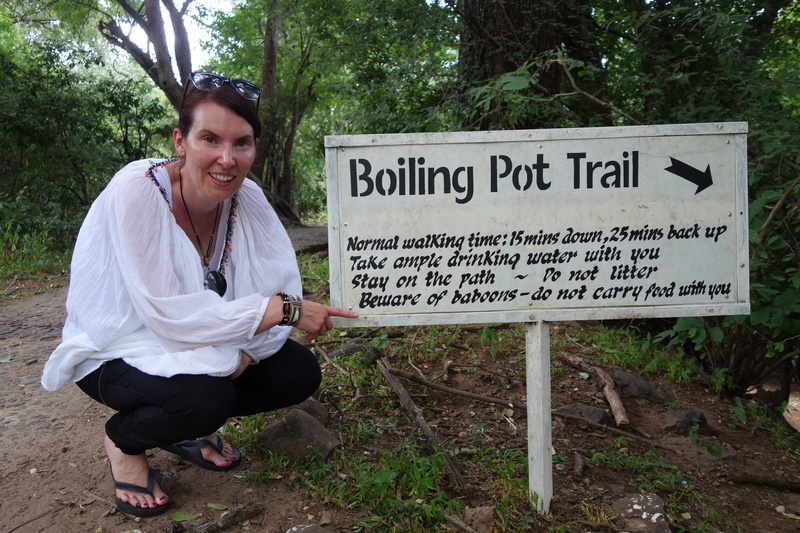 Baboons negotiated we follow the trail until we arrive at the boiling pot. All the water from the falls is forced into a narrow gorge which in turn empties into this huge circular bay, hemmed in by straight vertical rock walls. The water spins in gigantic whirl pools, brown, frothy and hissing in protest, after being thrown over a cliff and smashed against the rocks. It is scary to behold and the thought of falling in gives me a feeling of dread. We perch ourselves on a rock and watch the vortex mesmerised by its spinning action. With us are a couple from The UK, Caroline and Jeff. We take some photos and walk back together to provide an extra show of strength against the simian gang waiting up ahead. Thankfully they have gone but we later hear that they have taken some poor ladies backpack and removed its contents one by one from up a tree in search of a snack. Jeff and Caroline are staying at the exclusive Royal Livingstone which sits proudly about 150 meters upstream from the falls. They have been holidaying in Africa for three weeks and are leaving the next day. They invite us for a drink, which is lovely, but then realise we are not staying at the hotel and the guard at the gate checks room numbers. There is another trail we want to look at so we tell them we will try to get in as a visit to this lovely hotel is a must. Our time at the falls has met and exceeded expectations and we start to plan on how to get into the Royal Livingstone. I walk out the gate of the park but suddenly I am confused, this is not how we came in. I start to say to Emma “this is not….” when she looks at me like shut up just keep walking. We have by accident strolled through the private gate for the Hotel. I quickly stop mid-sentence and just keep walking. This is fantastic, we are in. We walk along the river past the hotel Zebras who munch on grass without a care or lion in the world to worry about, up to the main deck that protrudes into the Zambezi. From here we can hear the roar but we are far enough away so that it is now just pleasant background music. Despite our protests Jeff and Caroline buy us some drinks, I feel guilty but accept their gracious offer. It’s a wonderful afternoon with good company and a beautiful back drop. We insist on buying the last round as a thank you and watch the sun slip below the far side of the river. It is time to head back to our tent. It’s such a contrast to this world of waiters and wine but the two oddly mix well together. I don’t realise it yet but I have lost my Visa Card and will be back tomorrow searching to no avail. After spending a frustrating morning searching for my card, I concede it is gone and call Visa to put a stop on it. This is annoying, as now I am only left with Master and Cirrus cards. I wonder if this will hurt us at some point in the future where only the Visa network is available. We need to start thinking about our onward plans and how we are going to get to Tanzania. The next step, a bus to the Zambian capital Lusaka is fairly obvious and easy to arrange but beyond this arrangements become harder to make. 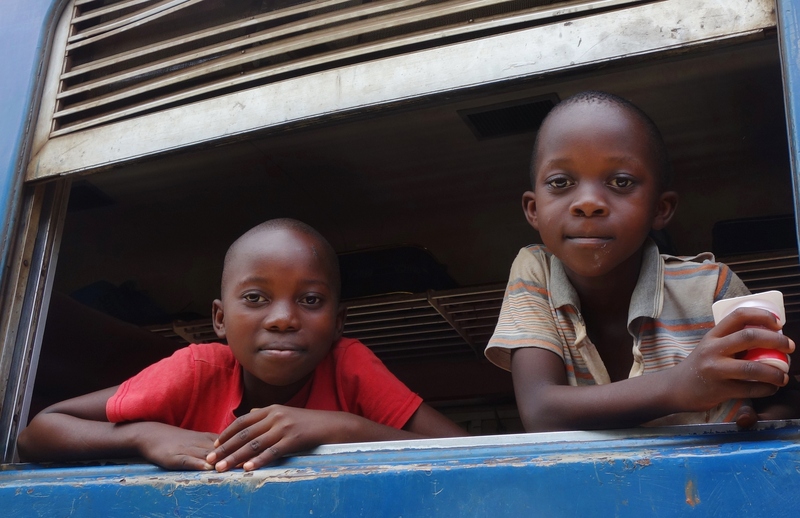 We know that a train runs from Kapriri Mposhi (a small town about 3 hours north of Lusaka) to Dar es Salaam in Tanzania, but it only goes twice a week and we can’t secure any advance seats on it over the phone for at least 10 days! 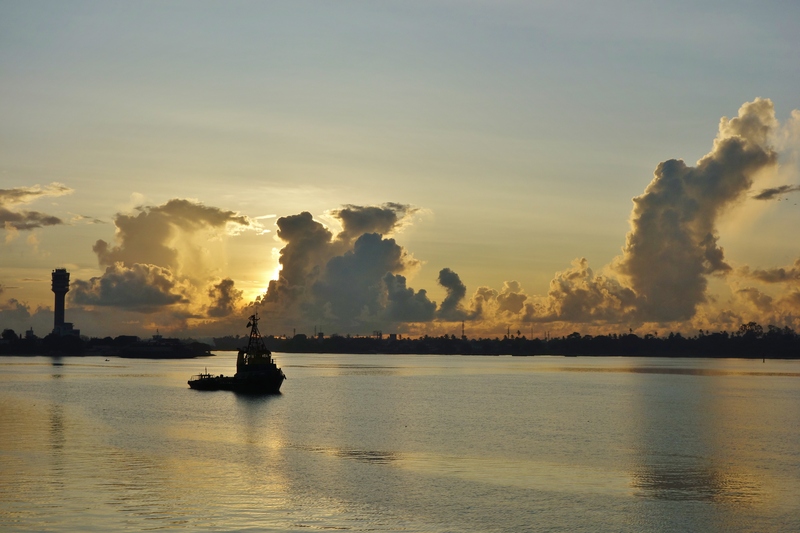 One of the guests at the hostel is an old Swedish man who tells me about the MV Liemba. A World War 1 battle ship that was sunk during the war brought back to life by the British and has been used as a passenger ferry along Lake Tanganyika for the last 90 years. It is an icon of Africa adventure travel and soon the idea of spending three days on this raw and decrepit relic ferments in my mind. We both start researching madly but can find nothing? Internet threads are filled with useless information and people who don’t know what they are talking about providing miss- information. Frustrated we make arrangements to go to Lusaka, where we hope to find answers on both the train and the boat. The next bus has seats available the day after tomorrow. It’s a little longer than we had planned to stay in Livingstone but we have time to spare before the next train is due to depart and at least 8 days before the Liemba is due to sail. We notice a poster on the wall “Walk with the Kings” advertising small group lion encounters. We have always wanted to pat a lion and now it seems is the perfect time. The hotel quotes us 750 kwacha per person but we get it down to 600 by going direct. Love it, always arrange things yourself, it saves a lot of money, we feel like it’s almost free. We are picked up in the afternoon but it is raining, so after a bit of a protest we cancel FOC and arrange it again for tomorrow morning. The next day the sun’s rays are back out and we sit down and have our briefing. An extra bonus is we are now the only two people going to see the lions that morning. Fantastic we have the huge felines all to ourselves. David our guide walks us about a kilometre into the bush. 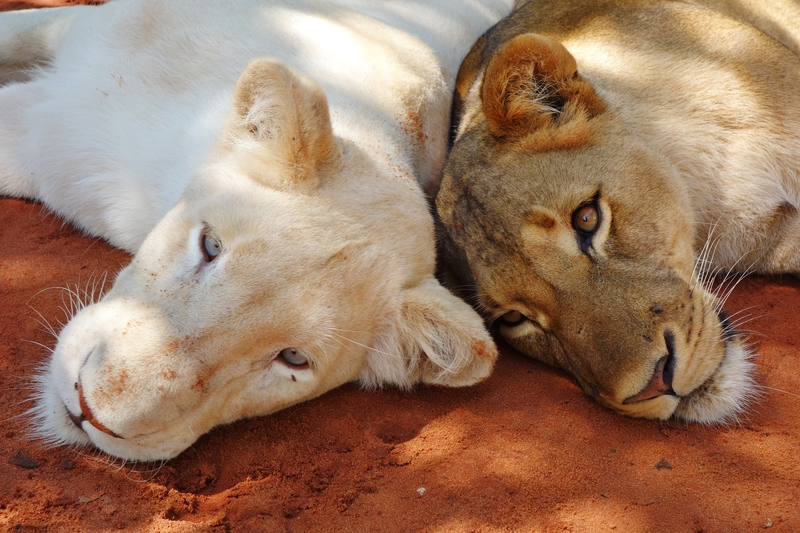 We reach a small clearing where we come upon two lionesses sitting. One is white the other dressed in traditional tan. They are magnificent, insert more superlatives. They are much larger than I expected. The poster showed half grown cubs but these young ladies are almost now fully grown. We are introduced and instructed to sit behind them and pat them firmly, they don’t like being tickled. If they turn around just stand up distract them with the stick, which they will assume is part of you. Emma bravely goes first and the handlers take my camera so I too can join in. After about 20 minutes of heavy patting and the occasional stick distracting, we all get up and go for a walk. The lions lead and we follow. This is amazing, I feel we are part of the pride just going for a walk in the bush. Their hips rise and fall with each stride. They stop to sniff the grass and smell some flowers. We reach a large tree and one of the girls decides to grip the trunk between her front legs and in three quick and powerful movements, she is about 12 feet up the tree and into the branches. Apparently when they are still teenagers they can climb, but as they reach full weight this will become difficult. The descent down the tree is not as professional as going up. She contemplates how to get down and then crashes into the ground, gets up and shakes her head. The ladies are put to bed (10am is lion bed time apparently) and they bring out Simba, a 2 year old male who sports a bit of a beard. He is despite his age huge and has paws the size of dinner plates. We give him a good solid pat, but he is busy watching one of the guides, who is dancing to keep him distracted while we pat him. His face is almost saying…. what is this idiot doing? Our time is up and we have had a fantastic encounter with these beautiful animals. I would strongly urge anyone staying in Livingstone to do this. It was very professionally conducted and not the Zoo show you get in Thailand when seeing the Tigers. It is now our last night in Livingstone, tomorrow we get the bus to Lusaka where we hope we can find out more about the train and the MV Liemba. What will happen next we don’t know but there are no answers here in Livingstone, it’s time to move on.